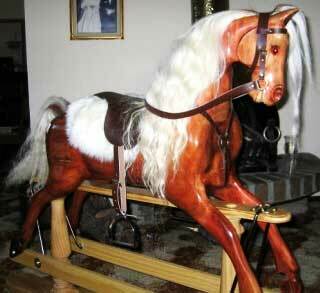 When my father retired from working, he took up making rocking horses as a hobby. After making one for my mother, brother and myself, he continued carving, and has made two more with another three on the go. My children ride our horse only on special occasions. It is a piece of work that was hand carved by their grandfather and is something that I hope they will keep and treasure and pass onto their children and grandchildren over time. With a time capsule in the centre, maybe one day it will be opened and the treasures will be found. Hence this is why we have a ride on special occasions only. Our horse sits with pride on our lounge room, where it is really a piece of art that is a talking point with any of our guests. The artist is my father; Neil McPherson. 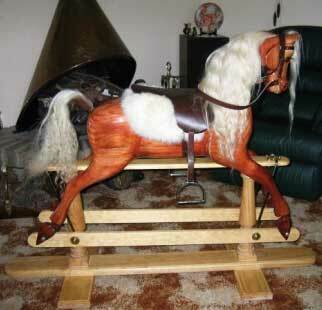 When my father retired from working, he took up wood carving, and then making rocking horses. The style of the horses are modelled after the famous rocking horse man from England, named Anthony Dew. A little bit about the horse; it is all hand carved, made from pine clear, hand stained and coated with poly urethane. The horse is of the large size; hence a child or adult could sit on it. The horse's mane and tail is actually cow tail, and the saddles are original leather made by a saddler. This saddler is a well known and respected saddler in Australia. All fittings are high quality brass fittings. The stands are a feature in themselves with the edges being routered. Each horse in the body has a time capsule, where currently the paper of the day was placed when the timbers were sealed. Under the saddle is a slot into the time capsule, where people can insert family photo's or memories.